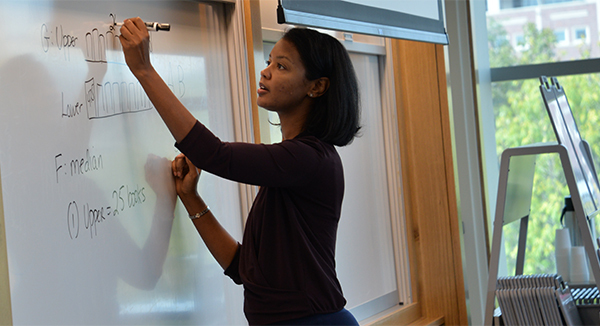 Stephanie Espy, founder and president of Atlanta-based MathSP Strategies and Problem-Solving, leads the GMAT workshop at Howard L. Hawks Hall on October 27. The College of Business at the University of Nebraska–Lincoln will offer a GMAT Strategy Workshop on Saturday, October 27, 8 a.m.-3 p.m. Led by Stephanie Espy, founder and president of Atlanta-based MathSP Strategies and Problem-Solving, the workshop prepares prospective graduate students for the Graduate Management Admission Test (GMAT). The GMAT measures verbal, mathematical and analytical writing skills for graduate admission and Espy explains learning strategies and approaches to provide a competitive edge. Named one of the four inspiring women in STEM by The Huffington Post, Espy discusses ways to decode the computer-adaptive scoring model, how to develop and execute on verbal and quantitative strategies, and tips on how to prepare a study plan to conquer the GMAT. Students interested in jump-starting their GMAT prep should register for the GMAT Strategy Workshop at: https://business.unl.edu/gmat by Wednesday, October 24. The registration fee is $125 and includes The 2018 Official Guide for GMAT Review book, continental breakfast and a comprehensive GMAT information packet. If participants already own the book, registration is $90. Check-in begins at 7:30 a.m. with a continental breakfast provided after check-in. Parking can be found at the 14th and Avery Parking Garage. If you have questions, please call the staff in the Business Graduate Programs office at 402-472-2338. An official score on the GMAT is one of the admissions requirements for the College of Business master’s and doctoral programs including the highly-ranked MBA program. Designed for students with a bachelor’s degree in any field, students can earn their MBA on-campus and online. Four other master’s programs offered at Nebraska require a GMAT score. They include: the online master of science in business analytics, the online master of science in finance, the master of arts in business with a specialization in intercollegiate athletics administration (MAIAA) and the master of professional accountancy (MPA). For more information on all graduate business programs, visit https://business.unl.edu/gradprograms.